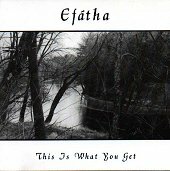 An acoustic folk duo, Efatha (E-fah-thuh), hailing from Lancaster, PA, blend their classical music training with folk and Celtic vibes to produce an edgy brand of folk. Relying primarily on acoustic guitar, vocals, and the viola, they manage to create beautifully, nature-yearning music from the soil of their soul. "Hymn of Solitude" is a beautiful, solo viola piece that plants the mood and vibe for the album. Delicate, soft, relaxing, and pure, it lets you know the album will be comfortable, but also something with spirit. Then there is "Christopher's Morn," a Celtic-tingled folk number that is just as soft and relaxing as the opener, but also has an edge provided by Scott Hertzog's vocals. "Taith I Nef" is a windy breeze of Celtic sounds that floats past your subconscious and moves your soul. The song is nature; rooted in the earth and tradition of its influences, the song builds upon what it knows and creates its own path. "Sailor's Jig" is an instrumental folky jig you can either dance or drink too while "Monkey" is an edgy folk number. Though I like their instrumentals better, as they are beautiful and heart warming, their edgy folk numbers (basically any one with vocals) have something to offer up too. The edge was a bit too rough folk for me, but with the viola, Celtic pride, and other influences, it was often saved. I'll give this album a B-.